Ingredients include 20 mg Vitamin C & 200 mg lemon extract, which aids in whitening, hydration, provides anti-oxidant, brightens skin tone and brings radiance. Using it before sleep helps get your skin ready for the repairing and renewal process. Using it before make up helps your make up stay on your face better. 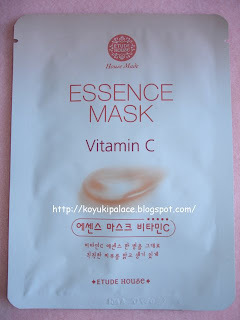 The mask contains lots of essence, quite watery, can't smell any vitamin C.
Vitamin C is an unstable vitamin, once it gets in contact with light or high temperature, it gets damaged. It is a vitamin that the human body cannot product, so we must absorb from other sources such as food, supplements and skincare. An average adult needs ~40g Vitamin C per day, which is equal to 1 orange, 1 peach or 1 kiwi. Those who smokes need 2x as much Vitamin C as someone who doesn't smoke.